Galaxy tattoos are one of the most beautiful tattoo categories. Galaxies are almost unexplored by humans, and it makes them look even more impressive. The scientists say that there are more than 200 billion galaxies in our universe. And it might be not the final number. The vastness of these creations is indescribable. Let’s take a look over the galaxy tattoos that we have gathered for you. A tattoo on the back of the neck of hands holding a spiral galaxy. Spiral galaxy dot-work tattoo on the right inner bicep. Dot-work black spiral galaxy tattoo. Black dot-work galaxy triangle tattoo on the left inner arm. Tiny galaxy tattoo on the inner ankle. Galaxy tattoos – why should you get it? The humans were always interested in things that were beyond of their reach. The depths of the oceans, mountain peaks and of course the sky. The mystery that hides in the far away galaxies is mind-boggling. We still don’t know whether we’re alone or not. Does our universe ends or is it endless? These and many other questions don’t let scientists sleep well at night. Blue and yellow galaxy tattoo on the right hand. Galaxy tattoo by Alexander Sandler on the inner arm. Despite the unanswered questions, we can enjoy the beauty of our universe. Huge telescopes capture high-quality photos of beautiful cosmic creations. Galaxies are one of those fantastic things that we can see in NASA pictures. If you dream about the cosmos every day and if you’re a bit melancholic – galaxy tattoos are a good option for you. Not only it looks gorgeous on almost every part of the body, but it can also be a great reminder of how small we are. When you’re in pain or feel sad, a galaxy tattoo will remind you that there is something more in your life. And it doesn’t end with your problems. Realistic galaxy tattoo on the left sleeve. Triangle galaxy tattoo on the chest. Black spiral galaxy tattoo on the inner arm. One of the most important things about galaxy tattoos is colors. Since the galaxies contain many colors, you can choose from a wide variety of them. As inspiration, we advise you to check out this gallery. There you will discover the gorgeous galaxy pictures taken by the Hubble space telescope. Of course, your galaxy tattoo doesn’t have to be realistic. For example, you can use other colors that don’t appear in the galaxies. But try to avoid very unnatural colors because it can distort the whole tattoo. A swirl of galaxy tattoo on the left shoulder. Small crescent moon galaxy tattoo. Frankenstein galaxy tattoo on the left inner arm. 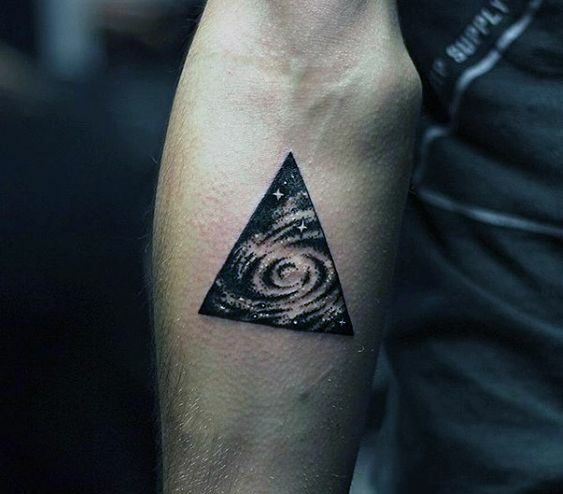 A galaxy tattoo in a triangle on the arm. Nebula tattoo on the arm. The galactic scenery in a hexagon tattoo. Watercolor cosmic tattoo on the right calf. Spaceship and moon tattoo in a galactic background. Galaxy and other cosmic sceneries sleeve tattoo. Things filled with a galactic scenery is another cool galaxy tattoos option. You don’t need to get a realistic galaxy tattoo. You can take any form of tattoo and fill it with the galactic or cosmic landscape. It can be anything: geometric shapes, animals, flowers and many other things. Cathead tattoo filled with galaxy background. Door tattoo with spiral galaxy inside. Galaxy lantern tattoo inked on the left calf. Keyhole galaxy tattoo on the upper back. Knife filled with galactic background. Lightning bolt tattoo with galactic scenery on the right shoulder. Rhombus tattoo with galaxy scenery and Pink Floyd logo by Adrian Bascur. Rose galaxy tattoo on the right inner arm. Star tattoo filled with galaxies by Adrian Bascur. If you prefer minimal design, you should choose monochrome colors. Galaxy tattoos look good in black and white too. Also, it gives simplicity to the design and if you want you will be able to color it in the future. Spiral galaxy tattoo in black and white colors. Black circular galaxy tattoo on the upper back. Rhombus tattoo with black spiral galaxy inside. Black star tattoo with galaxy inside. If you are sure that you want a galaxy tattoo, we suggest looking into the real pictures of galaxies as an inspiration. Along with the galaxies you can also use other space elements. Such as nebulas, planets, stars with constellations, black holes and other cosmos-related things. If you’re a cosmos fanatic, you can combine your galaxy tattoo with spaceships or astronauts, satellites, and solar systems planets. Each of these components will go perfectly with your galaxy tattoo. Dot-work spiral galaxy tattoo on the arm. Jar tattoo filled with a cosmos landscape. Another spiral galaxy tattoo in a triangle inked on the left inner arm. Milkyway dot-work galaxy tattoo on the right thigh.